In the Jungle a Lion Gently Roars- or possibly sleeps. Being a private company owned exclusively, or pretty much so, by Lord Heseltine, Haymarket doesn't have to say much about its results, but Lord H normally does. This is what he says about the last year results. Turnover is up just 1%. In other words it went down in real terms. Lord H brags that his turnover from digital has grown to 8% of turnover and 13% of profits. Thats £20m of turnover and £4m of profit. Its a small percentage but a reasonable number gven the breadth and range of the portfolio. Haymarket may be better placed than many companies to see through the changes needed in the 21st century media world.. It is in private hands and likely to remain so. It has nothing to lose by being braver than its public peers. However, in b2b Haymarket has done little that is truly innovative. Haymarket says they are a multi platform media company. Haven't we heard that before somewhere? Oh yes, its what they all say. Please, please someone say something new. Please someone find a new angle. "Magazines are dying so we thought we would do some other stuff", is not a strategy for the future, its a tactic for now. Lord H brags in his piece about the creativity of his people. I hope they find something to inspire us in new media as Lord H himself once did with his first magazine, "Man About Town". 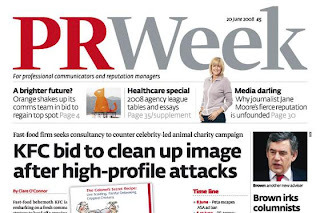 Press Gazette reports that PR Week has had a redesign. The mag has introduced a blue tag to show that a story can be followed up online and claims to have changed the print editorial to make it a " a round-up of the week’s stories and follow up key stories, providing more detail and analysis." A weekly news paper was always a round up of the weeks stories with some detail and analysis. Is this PR Week rethink a step far enough? Why not produce the equivalent of "The Week" for readers, with summaries of stories from all media in one place. Then add detailed analysis, comment etc. Readers of magazines notice very little unless the change is dramatic. If you want to signal that you are really different, change everything, format, paper, style, sequencing of sections, the Editor, the strapline, the cover page - everything. Then the reader will notice. The facsimile of the new PR Week and the old is shown at the top. Which one is the new one? They both look like traditional b2b news weeklies to me. Still PG, of which I am very fond, has given up on asking questions it seems, and has just burped the content of the press release. I thought journalism was about taking what someone says and then testing its voracity with an alternate or challenging view. Apparently not. Silly old me. "Its alright. No really its all fine. Don't worrry, everythings great. Well not everything, we are a bit worried about PR Newswire, recruitment, conference revenue, next years shows, this years advertising, next years advertising; but don't worry. Well we to be honest we worry a bit. We're not worried too much though and where the crunch has started to hurt we fired some managers - so that'll fix it. So please don't worry. Really. We mean it." The City heard all this and wiped 30p off the share price or about £70m in value. "It's the annual conference of the Specialised Information Publishers Association (SIPA) at the Tower Hotel, London E1 on 8-9 July. Keynote speakers include Tim Weller, CEO of Incisive Media talking on 'narrow and deep' publishing; David Worlock of Outsell Inc, on the state of the industry and the future for paid content; and Mark Ragan from Ragan Communications in the US on taking his products from print to online. So that will be Tim saying business media is great, David saying its all about workflow and I have no idea who Mark Ragan is. Still it looks like fun. Lots of workshops and interactive stuff and interesting if only to see which of the speakers really understands just what is going on. Apologies for lack of posts. But hey, I don't know about you, but I'm really busy. The Times reports this morning on impact that the difficulties debt providers are experiencing in spreading the loans seciured to do the Emap deal, will have on future media deals. The two in play are RBI and Informa. In the smaller media sector there is much speculation also about the future of Centaur. If funders get nervous that doesn't necessarily mean that media deals won't get done - but it will mean further pressure on the level of leverage in private equity deals and that in the end means a lower price. The upside of the postulated merger of UBM and Informa was that Informa got to improve its debt profile whilst UBM became part of a group with less dependence on marketing revenues. The downside, which in part explains the scuppering of the deal, is the reverse; Informa gets to be part of a group which is very exposed to marketing revenues and owns someweak mags, whilst UBM ends up part of a group with a weaker balance sheet. No surprise then that a private equity club is now running its ruler over Informa. Don't hold your breathe. As The Guardian and others point out, the debt market is tough and the deal complicated. Meanwhile I understand that RBI staff are now being told that a deal could get done in October (they were previously told August). Although inevitable, this increases the period of uncertainty. One hypothesis is that the deal will be a back to back to enable the new owner to immediately dispose of Total Jobs. Assume a price of £1.2b with 750m of debt. Some observers have speculated that totaljobs is worth on its own as much as £400m (thats about 10 times revenue which sounds mad - but this asset is highly attractive and will have a lot of auction heat.) The new RBI owner can trouser the proceeds from totaljobs and pay down the debt, leaving just £350m to service. I reckon thats an interest cover of around 5 times. That would leave RBI with plenty of free cash flow to buffer it from downturn, fund staff reduction costs or invest in product devlopment or further acquisition. My only problem with this idea is that it implies a 5 multiple for the the business net of Totaljobs - which seems very low - or in a world where magzines are declining at a rapid rate perhaps that's a fair price. This kind of back to back is complicated and time consuming to put in place. I forecast completion in December, not October. When you take Tim Weller away from talking manifest tosh in his capacity as a leading light in the PPA, he can be persuaded to talk some sense. Contrast this interview at e-consultancy with the feeble speakings of his rival at CMPi we reported on last week. Weller says some of the stuff that everyone says - we must do online and print and events; but what is interesting is his level of detailed grasp of what needs to be done with the business. Weller rightly argues that magazines have to change to survive in the online world. They need to be more like The Economist he says, which has thrived in an online world because of its thoughtful and analytical approach. He rightly argues against what he calls brochure ware in web sites - lazy and pointless papering of the web with ill thought through content - and is honest enough to admit that some of his sites are not very good. He advocates muliple models to make online work - not just selling ads - which is really hard to do in b2b, but also lead gen, recruitment, search, data and workflow. If we were being critical we might say that doing everything isn't a strategy. Real strategy is about deciding what you don't do. However in a world were the certainties of the business model of the past have unravelled, I'd rather back a plan which was too innovative than one which was hoping it will all turn out all right in the end. Too many business media execs are running on the spot. and hoping for Jam tomorrow. Wellers enterprise may struggle (he has far too much print product in my view) but he will do better than most of his rivals if only because he is running forwards. This article in the Times is a lovely interview with Peter Rigby, Head of Informa. Such is the incisive nature of the Thunderer these days, that we learn that Peter gets up at 5am, runs several miles a day, eats croissant for breakfast, is a really nice guy, works non stop but still devotes time to his family - so he is lovely in every way, and clever and hardworking. And on the issues of the moment - the possible merger with UBM? It may or may not happen apparently. Excellent. Glad we cleared that up. Please read the letter that I wrote. I nailed it to your door. But let's face it, when you're any media and you're laying people off; when you're asking your managers to reforecast because you're missing your numbers; when your print magazines are shriveling; when you haven't raised rates for print ads in years; when online-only competitors are cropping up all around; when employees are leaving to start competitors; when you're so busy protecting declining print businesses that you're always a step behind in e-media; then maybe the future isn't so bright, and maybe you should say that. Sometimes I want to tear my hair out in frustration. This article on the Precision Marketing website seems at face value to be saying something interesting and contrary to the general view on this blog. It purports to argue that business people still want mags and therefore marketeers should think very carefully about wasting their money on digital marketing. It is argued that this is because print brands are trusted (and Internet coverage is not) and magazines are read "in a more relaxed state of mind". What possible value is there in comparing media which I have requested with inbound mail that is spammed into my box. In any case what on earth do these statistics mean? Does readership mean average issue readership, total readership or some other made up definition. What could a 73% reponse rate possibly mean? 73% of magazine readers responded to all the ads? How is this supposed to compare with the claimed 28% reponse rate to solicited email? What on earth is being measured here? My complaints are, if you are going to write an article on the web, make an effort to write it for the web (links!) and when you write it, please do so in a way which makes sense. If anybody has the link to the original research I would be interested to see it so we might learn something - anything. Dear God lets try and learn something - even if its only how to write a web article. Anyway, according to the article, as its on the web, we are not supposed to trust it anyway. Thats another fifteen minutes of my life wasted. Bugger. A rare interview with a leading b2b exec is published in Press Gazette. Gary Hughes, former Emap bean counter and now CEO of CMPi. As its written in a language called Corporollocks some of you might find it hard to understand. To help you I have re written it with my own translation of what it could mean. "We are doing more events because publishing is dying on its arse. We call this a multi media platform strategy because it sounds less panicky like that. Our sales people don't know how to sell digital and I am hoping that a crash course for them all last May will have made them into super digital sales people. I have worked out that if I pay sales people for performance, that's a necessary but not sufficient condition for success. I haven't worked out what the other conditions for success are. Editors make better sales people than sales people and you don't have to incentivise them with money. I just wish they'd spend more time selling, instead of wasting their time writing and checking stuff. In case this worries my journalists (who I call colleagues in the hope they will think I am one of them) I will say I don't want to push this too far. But I do. Magazines are dying and even though I believe that, I realise its too scary to say so. Instead I say in code that magazines are sort of dying but we continue to invest in them - hopefully without spending any money - certainly not on incentivising the pesky editorial folk who make the things. Private equity owners are only in it for a quick buck. Lucky bastards." The Telegraph and others report that UBM and Informa are in talks about a merger, which would create a very big thing indeed. The question that needs to be answered though is whether being a very big thing indeed is enough to make it worth doing. Post acquisition integration work is normally badly done in these deals. Senior executives love the excitemtn of the deal but get bored with the detailed implementation. Costs come out, but the strategy upside somehow never sees the light of day. The argument is that Informa is better placed post deal because its indebted balance sheet would no longer look quite so scary whilst for UBM it would reduce its exposure to advertsing revenues. All true of course, but strategy is much more than the maths of the deal if long term value is to be created. How can the Informa conference expertise be implanted into the UBM publishing business? What is the plan for replcing the profits from dying magazines? (Paul Conley reports on more lay offs from UBM in the US). How will the new merged entity use its bigger muscle to accelerate growth in developing markets? Some argue that all merger talk might provoke a private equity bid for Informa. This would be bad news for the RBI sale as Informa would be seen as a more attractive business. Perhaps Informa should merge with RBI. Now theres a a thought. Nobody said it was easy, but this report by Rafat Ali implies that the sale of RBI is very hard indeed. It appears that Reed Elsevier has been lining up debt which it will make available to buyers providing the buyer takes the whole caboodle. This is called stapled finance and is not that rare, but it clearly shows how nervous Reed is becoming about the ability of private equity to get their debt ducks in a row to make a bid. The availability of debt finance may well flush out more interested bidders who will be able to make an independent decision on the equity piece and not need to seek their own debt funding. Reeds hope will be that this makes for a more competitive auction and thereby a higher price. It also underlines Reeds determination to to sell the business in one deal rather than risk flogging off the good bits and then being left with a load of old toot to get rid of. Nevertheless, the mere fact the finance is available does not necessarily mean that the price expectation will be met. The price tag is supposed to be £1.3b. The stapled finance is said to amount to £750m on RBI earnings of £160m which amounts to a little over 2.5 times interest cover. In the normal world this looks unagressive. But this is not a normal world. Lets play with the maths over three years. If we assume the capital is repaid over seven years and profits are flat, cash flow generated amounts to £480m. Capital repayments will be £321m and interest repayments will be £180m. Equity has grown over the three years(as the debt has been paid down+the cahs outflow on debt servicing) from £550m to £849m which is an annual return rate of around 15%. Private equity return rate expecations are much higher than 15%. So to get to a better return rate either the price has to fall or the profits have to grow. To achieve a 25% return rate, the equity value would have to be over a billion pounds in three years. That implies a profit growth of perhaps £20m. At face value this is achievable, but remember that RBI has a lot of magazines. Are they going to grow or decline? They will decline by my estimates by at least £20m over three years. That means the rest of the business has to grow by £40m to hit the 25% target. Or put another way not far short of 10% profit growth every year. Looking a little harder now huh? Oh and there's another problem - all those liabilities on severance and pensions. Cutting costs won;t be cheap. Lets say the new owner culls 250 jobs of folk with average 5 years service. Thats a severance cost of about £5m. Now all this may be doable, but if the market got tough(er) and magazine decline got aggressive, and web spend didn't increase (what will happen to Total Jobs revenue in a recruitment downturn?) it could all get a bit scary. The stapled finance arrangement makes perfect sense for Reed but, in my view, it is not certain that this will be enough to shore up a price expectation much north of a billion.